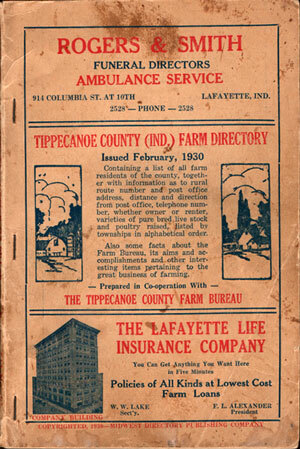 Published by Midwest Directory Publishing Company, Topeka, 1930. Cover has some wear and stains. Inside pages are nice and clean. A directory of farmers that includes the name of the farmer, rural route number, post office address, distance and direction from post office, telephone number, owner or renter, and varieties of livestock and poultry raised on the farm. Soft cover, 92 pages. Also includes numerous business ads.